Mt. Shasta Brewing Company Celebrated the 1 year anniversary of BrewGrass Night!! Here is a beautiful scene: a hot day, the sun going down, your family having a blast at the Carnival, and you at the Mt. 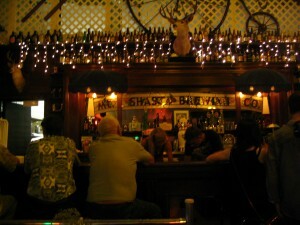 Shasta Brewing Company, located right next to all the Carnevale festivities, sipping cold, cold, beer. 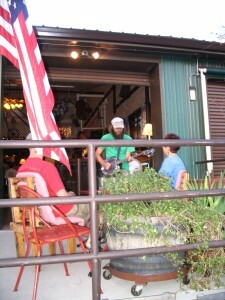 The local talents of our bluegrass players serinading you while you tap your feet and share a joke with your buddies. The Mt. 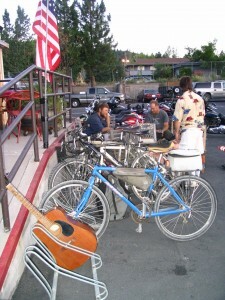 Shasta Brewing Company has been the landing spot for Weed’s BrewGrass night, every single Thursday night, starting around 7pm and running until the bartenders kick us out, around 9:30….10pm…. This event started one year ago, on the Thursday that kicks off Carnivale Weekend. It was started by Billy Shaver sitting on his back porch playing his banjo to the trees, when he realized, hey- let’s play at the brewery, we’ll call it….. BrewGrass night!! His goal was to have it so the working people could come out and have a few beers, sing a few songs, and be home in time to get up again in the morning…. genius… thanks Billy!! So he called up his buddies that he had been jamming with, guitar John, mandolin Jack, and put the word out to the local musicians to show up for the first ever BREWGrass Jam!! The rest of the community jumped right on board and the word of mouth spread like wild-fire (sorry for the reference….wild fires are devastating around here, be safe, don’t play with fire) The bartenders at the Brewery wowed us when there was balloons (thanks Christine) and the birthday cake (thanks Jaqueline) and we had a real down home party, Thank you MT. SHASTA BREWING CO.
Vaughne and Barbara, we love Josh the brewer, he makes us so hoppy! OK, who's driving the Guit-Box home tonight? BrewGrass players are asked to be highly influenced in bluegrass music and have a wide range of chord progressions ready to pull from, and lyrics to sing~~ Billy loves a good challenge. This is a family establishment so feel free to bring your kids! IN fact there is some of the bluegrass players that have attended that were only 12 yrs old!! Banjo Billy singing to a couple in love….with their dogs!